Three components you should consider above all others… the camera body, the lens and you! When buying new equipment your money is on the line. And, camera equipment is expensive. To make the best purchase you need to consider three essential things above all else. These are the fundamentals of buying the best kit you can afford. The camera is NOT the most important purchase. Your lenses are the most important. A camera records light. If the lens is perfect the camera will record it. If the lens suffers from chromatic aberration, optical distortion, internal reflection, inaccurate element alignment or any one of many other defects your record will be affected. The lens is the critical component. The lens forms your picture. Buy a bad lens you will get a bad picture. The camera comes second. Don’t purchase your equipment mainly around your camera. Think first of what you want to achieve, then consider what lens you need to achieve it. Next, work out what camera you should buy to record the pictures created by that lens. Future additional lenses you buy should be of at least the quality established by your original lens purchase. Lesser lenses would compromise your standards. The lens governs the integrity of your system. Don’t buy a camera body to impress others. Buy a camera body to meet the quality needs of your lens. A body that exceeds the quality of your lens is wasted money unless you know you will be able to afford to trade up your lenses later. You will probably spend more money on lenses than camera bodies for your hobby. So, buy the best possible lens you can afford. Then, with the rest of the money, buy your body to meet the quality standard established by your lens. Don’t buy the camera and get a cheap lens with the rest of the money! Look to the future. Make sure your camera body is what you need. Modern cameras are pretty sophisticated. They have the ability to out perform the inexperienced user by a long distance. So if you are inexperienced at buying/using a camera, make sure you get the camera you need. 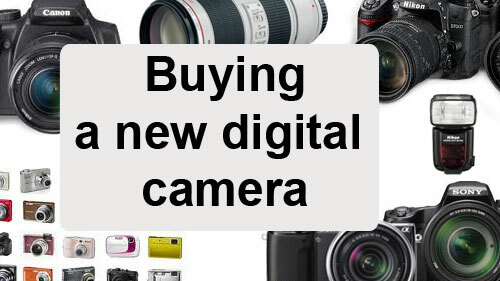 If you are buying a camera that has everything then you may not be able to carry it. So consider size weight, functions and image quality – but most important consider what you want to do with it. There is little point buying a Top-Of-The-Range professional camera, for holiday snaps once a year. There is little point buying a point-and-shoot camera if you want to do high quality macro work. Spend time listing what you are interested in and then look for the camera body to meet that need and match the quality of your lens. People often rush into buying a camera. A committed and experienced owner will probably have a pretty good idea from discussions with other photographers and some reading about their needs and aspirations. They will have spent months thinking about it and considering the options. Inexperienced user/buyers don’t have that background. Consider joining a club and talking with members for a while first. Get a range of opinions and try to understand the issues that make the purchase correct for you before buying. Don’t just walk into a camera shop and hope you will get good advice. You will probably get great advice relating to the person serving you. A sales assistant will think hard about two things… her commission and what she would do in your place. Both those are not about your photography. Spend time looking carefully at your requirements before passing over hard-earned cash. Your judgement will be about your photography. Take time, learn a few lessons and understand photography before making a big purchase. It has been said many, many times that you can make great photographs on quite cheap equipment. Great photographs are not created on expensive, feature-rich equipment unless you are able to use that equipment properly and have lenses that match its quality.